Thai cuisine may not be so popular here compared to other Asian cuisines like Chinese or Korean but Radisson Blu Resort intends to break the trend. The first specialist Thai cuisine restaurant on Denarau is offering an international dining experience at the Radisson Blu Resort. A specialty chef who arrived from Thailand last week aims to make Thai cuisine and Chantara stimulate the taste buds of both local residents and visitors. Thai chef Pitchayapon Thiptham, 30, affectionately known, Mickey. Chantara Thai restaurant is the newest addition to Radisson Blu Resort. Chef Thiptham has worked around the globe including Bangkok, the USA and recently Switzerland specialising in Thai cuisine. Other achievements include a: bronze medal in “Tom Kha Kai” contest in the Thailand chef’s competition in Bangkok, 2010. A silver medal in “live” cake decorating “Thai theme” from the chef’s competition 2010 in Bangkok and a Thailand certificate 2e Prijs Lunch 2012 Star’s Grand Bride Tour Utrecht in the Netherlands. “I have heard a lot about Fiji and have always wanted to work here so when the opportunity arose, it was hard to refuse,” he said. All his working life he’s been working in big metropolitan cities in the world, so the change in scenery is awesome. 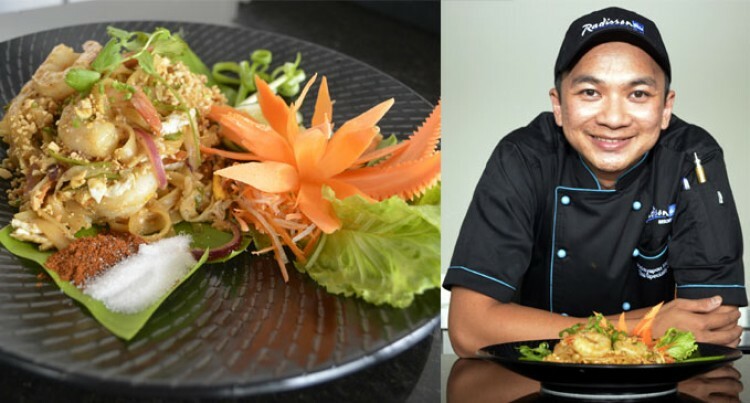 He wants to explore the Fijian cuisine more and also pass on his knowledge about Thai cuisine to his workmates.